So by now, it's well known that Toys "Я" Us, the beloved toy store, is closing. And it's well known why. So we're not retreading that here. This is something else. I didn't grow up with Toys "Я" Us. I've talked about that before - I can recall going to TRU literally one time as a child, though I couldn't tell you how old I was or anything else about it. What I remember is the trip, my mom taking me to this famous place that advertised on TV all the time but I'd never experienced. What I remember is that it happened, not the specifics of what happened. It wasn't until I was in high school that there was a TRU closer to me. It still wasn't in my town, but rather next to the mall half an hour away. Two malls, actually. And two TRUs, each half an hour away in different directions. 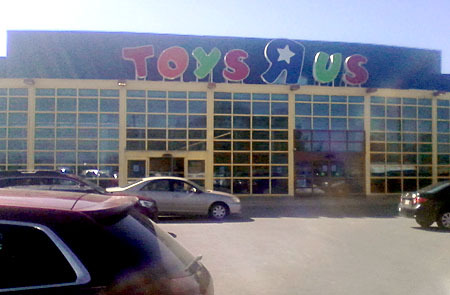 Drive 30 minutes north, Toys "Я" Us. Drive 30 minutes south, Toys "Я" Us. That's a bit too far to drive on a regular basis - the kind of trip that needs an excuse, you know? And then when I went to college, the nearest TRU was half an hour away to the west, which... why do I keep living half an hour away from Toys "Я" Us...es? Anyway, after college things changed, so for many, many years now, I've gone to one Toys "Я" Us or another at least once a week. Averaged out over the years, and counting times when I'd go in the middle of the week and then another time on the weekend, it probably works out to one TRU trip every four or five days. 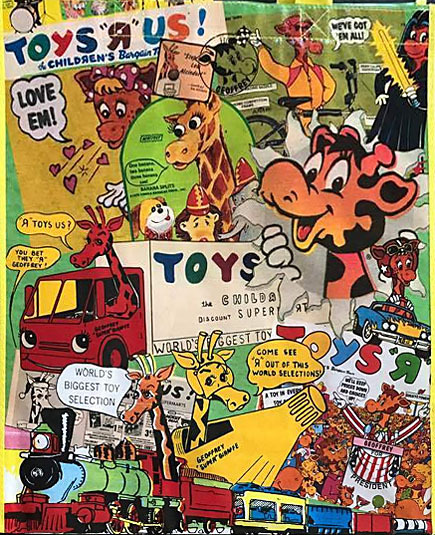 Here's a conservative estimate to provide a little perspective: since we started OAFE, I've been to Toys "Я" Us more than 800 times. So to say that I'm going to miss this chain of stores is an astounding understatement. 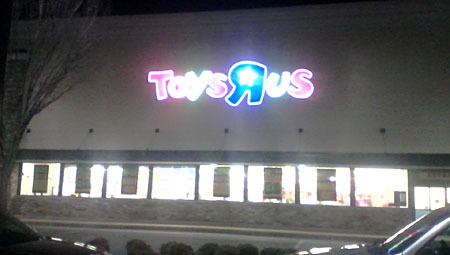 I go to Toys "Я" Us the way other people go to church. And for a lot of the same reasons! Like Dinosaur Dracula said, it's a spiritual rejuvenation, a worthwhile trip even if there wasn't anything new to buy that day. But that's also not what this PoA is about. Imagine a close member of your family. You've known them for years, they've always been there, they've been the one constant in your life, and then one day you lose them. And after you do, you realize that you only have a single photograph of them, and it's so old you can barely recognize them. But it's all you have any more. Imagine the pain that comes with that. Well, I don't plan on making that mistake with Toys "Я" Us. So starting when the closure was confirmed, I started taking a camera with me to TRU, and documenting every one I visited. For the past decade or so, this has been "my" TRU - the local one, the one I've gone to at least once a week. The one I've gone to more than any other in my life. The one that was there at some of the best times in my life, the one that was there for me after the worst day of my life, and the one that was there on many, many kinds of days in between. Observations: The news of the shut-down is a few days old at this point, but it doesn't seem to have sunk in. There were lots of people shopping. There were new items on the shelf. This looked like a store with a future. Nobody's giving up yet. What I got: nothing. Not because there were no discounts yet, but because I didn't see anything new I wanted. This was just a normal trip to the store. It was Saturday, so I decided to take a drive. The destination was a distant TRU I've only been to two or three times before. It's in a different state, and I'd usually stop there after going to a comic-con down that way. It's at the end of a weird little strip mall with a two-story Walmart. Have you ever seen an escalator just for carts? That Walmart has one! And without a TRU there, I probably won't have an excuse to go out of my way to that place again. Observations: Now this is more of what I was expecting after the liquidation announcement: the shelves are a total mess, with lots of empty spots. Though to be fair, that's kind of what this store looked like every other time I'd been there, so maybe it doesn't mean anything yet. What I got: Justice League Parademon (I'd had one stashed at my TRU for a month or so, but it was found a while ago); Grossery Gang Dodgy Donut. 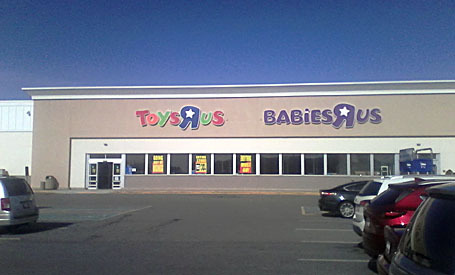 This Toys "Я" Us is - you guessed it - half an hour away from me. I used to go up that way more often, because there were two TRUs about 10 minutes apart from each other: they've both since closed, but this one is technically one of those, just moved to a new location. 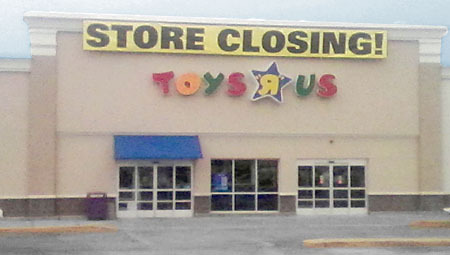 I recall the day I went to the TRU at "the sideways mall" (so-named because of its effed-up parking lot layout) and saw closing signs and big sales; if the clerk hadn't told me they were moving, I'd have assumed they were disappearing for good, and probably never would have gone up there again. 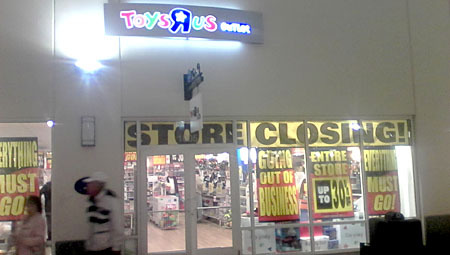 (By contrast, the other TRU really did close, and didn't reopen elsewhere. Which was a surprise the day I tried to go there and the building was abandoned. Dang.) Anyway, it's a shame this trip was at night, because this TRU has cool thematic pylons in front of the doors, and I've never seen those elsewhere. Observations: The wrestling toys section is looking really picked-over, but that's about it. In the girls' section, the shelves of Claire's Boutique items are covered by brown paper over the front for some reason, though the stuff behind them is all still there. What I got: Nothing. Considered getting "Value Stop" Ash, because I've never seen it anywhere before, but passed because I have the Ultimate AvED figure. Hey look, we're back at The Local! And it snowed. 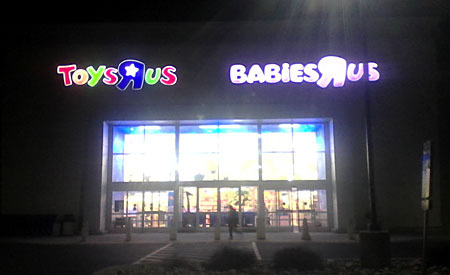 You notice how I don't bother photographing the Babies "Я" Us side of the building, because I don't care about it? This was the day the liquidation sales were supposed to start, but that wasn't why I was there: it was just my usual weekly trip. Observations: Store's still looking normal. More people in today than there'd usually be on a Thursday afternoon, but not "the vultures are circling" levels. They're no longer accepting checks - the signs above the registers say so - and a printout by the credit card reader announces that "Я" Us cardholders no longer get a 10% discount. I couldn't help thinking about Charles Lazarus' death, too. What I got: ML Songbird, Taskmaster, Cobra, and Iron Man, because they were cheaper at TRU than at Walmart; Gundam Converge Beargguy and RX-78-2, even though I don't know what they are. Okay, here we go. There's no saying how fast the various Toys "Я" Us stores will end up closing, so I didn't want to waste any time. I planned a huge road trip that would take me to every store within a reasonable distance. Well, mostly reasonable. No sane person would have done what I did. Looking at a map, I planned a massive loop that would take me to two dozen different stores - TRU, Walmart, Five Below, Target, Walmart, Kmart, Walmart, TRU, Target, another Target, Walmart, an outlet mall with a TRU in it, Target, TRU, a giant mall, Walmart, Target, TRU, Target, Walmart, Kmart, Walmart, TRU Express, Walmart, then home. Like I said, insanity. And along the way I stopped at a small mall and a Barnes & Noble I hadn't expected. Full disclosure: I did not make it to all those stores. The trip took so long that eventually things were closing - no point in going into a big mall you've never been to at 8:45pm, right? In hindsight, I could have skipped a bunch of the Walmarts and Targets (though to be fair, I did find good things at some of those, as well, though a few of them were busts). If I'm remembering everything right, I ended up hitting... 21 stores that day? 22? Counting the surprise mall as three, since I went to GameStop, FYE and Hot Topic? That's not bad, considering I'd never been to most of these places and had no idea where I was going. So let's talk TRUs! This is what I would consider my "backup" Toys "Я" Us - it's half an hour away (again! ), but I try to get out that way as much as I can. Not every month, but a couple times a year, surely. It sits behind a rickety old house, and there used to be a nice stand of trees next to it, but those were recently cut down and a new shopping plaza is being built next to it. Seems like a waste of land, now; if only they'd waited, they could have taken over the existing TRU building. So it goes. This is another TRU I'll miss when it's gone. Observations: Again, fairly busy, but only a typical Saturday kind of crowd. The Marvel section is slightly empty, and the NECA/Mezco aisle looks like a hurricane has hit it. But they've also got a lot of stuff my local has never once stocked. Stuff I'd have bought long ago if I'd ever seen it there. What I got: major NECA haul! Preacher Jesse and Cassidy, Valerian and Laureline, and the Ultimate T-1000. The first "new" TRU I went to, this one was across the street from the unexpected mall. Despite the fact that it's the same "glass front" style as the previous one, you can tell it's not the same place because the doors are in a different place. Observations: Now here were the major crowds I was expecting! Almost every aisle was packed with people, like going shopping right before Christmas. No thank you! What I got: Blade Runner Luv and Borderlands Zero. I don't know who any of these people are, and yet: toys. I had a heck of a time finding the outlet mall, but once I did, I parked by the Toys "Я" Us sign, figuring that's where the store would be. And it was, but not in the direction I thought, so first I hit one of those game-and-calendar stores, then finally found a directory to point me to the TRU - if I'd turned right instead of left, I'd have been able to see the store from where I walked in. 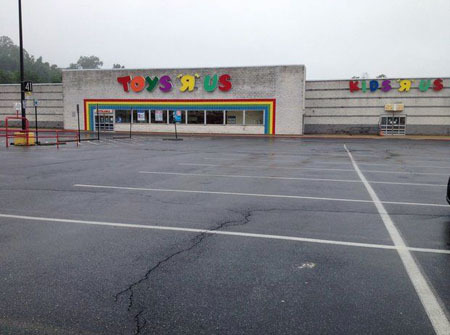 Observations: oh my god, this was so obviously an ex-KB Toys that was converted to a TRU. Like, walking through the door, I was instantly transported in time back to the '90s. The checkouts in that little nook against the side wall, the flooring, the number of aisles... the only thing missing was a cage at the front of the store with Bumble Balls jumping around inside it. On my quest to say goodbye to Toys "Я" Us, finding the corpse of a Kay Bee was perhaps the most perfect moment of the day, a summation of everything I was doing. This will give me joy in my heart for a long time to come. What I got: DC Multiverse Atom, Batman, Batwing and Reaper - the other four figures from the same series as Duke Thomas. Are you freaking kidding me?! Walmart hasn't stocked these, Target hasn't stocked these, Amazon had them available for about a minute... but here comes TRU, on its way out of business, and yet still selling toys better than anyone else can. I'd only wanted Reaper, but ended up getting all four because they were there. I am completely floored by the existence of this dual-legacy store, and completely floored by its toy selection. Seriously, high point of the day! I learned, recently, that the largest mall in the US is in a town called "King of Prussia," in the suburbs of Philadelphia, PA. (Yes, the more famous Mall of America takes up a larger amount of land, but a lot of its space is given over to things like roller coasters and other attractions; when it comes to the biggest indoor shopping space, KOP is the winner.) And since there was a TRU next door, it seemed like that was a place worth going, meaning that technically the point of this day trip was to go to the King of Prussia Mall. But since it was 8:30 before I got there, I didn't even get to go inside. A failure is me! 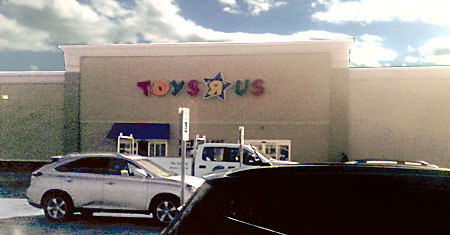 But hey, I still got to go to the Toys "Я" Us. 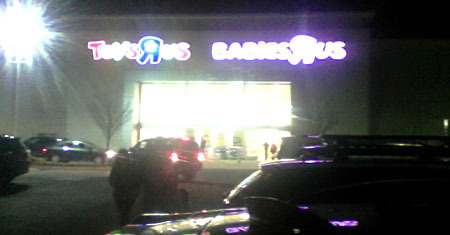 Observations: The "Babies" half of this store was looking really empty! At least, from the front door - I didn't go over that way, because why would I? An employee who was cleaning up the Avengers/Justice League area at the front of the store was weirdly super-helpful, talking to me like I'd never been to a TRU before. Oh, my friend, if only you knew! But hey, props to him on not slacking off as the end approaches. What I got: Beetlejuice Minimates and the TRU-exclusive Spider-Man Homecoming Iron Man and Happy Hogan Minimates, because how much longer will I have the opportunity? Also, an "Ultimate Batmobile" Lego polybag, because it looks fun, and a Lego Batman Egghead Mech Fight, because it looks like a giant egg. I skipped the mall, a Walmart and a Target in order to hurry over to this next Toys "Я" Us. Observations: I observe that all the other TRUs were closing at 9:30, but this one closed at 9. So I was too late. I will now never set foot inside this particular Toys "Я" Us - it will be forever alien to me. So you know what that means: it had every single toy inside it that I ever wanted but was unable to get. It's Schrödinger's toy store! The place where, if only I'd been there before it closed, they would have had everything in stock. Everything. Like, an aisle full of SOTA, ReSaurus, and Plan-B toys. Every NECA figure I've regretted passing on. Piles of DST. Everything. What I got: You can't prove a negative. Anyway, I hit a few more Walmarts after that, because they were still open, but that was the end of my massive TRU trip. Was going to the movies, so I hit up The Local again. It's a great way to pass a couple minutes, and I'm going to do that for as long as I can. Unless there's some kind of weird circumstance, this will be the last TRU I ever go to. But not today, though; someday. Observations: Aww, man, the "Store Closing" sign is up. That hurts. Back at it again at Krisy Kreme The Local. Another movie, another excuse to stop by. Observations: I can start to tell things are selling out - aisles are being consolodated, pegs aren't as full as they were before, stuff like that. If I weren't going as often as I am, though, I probably wouldn't see the difference so easily. What I got: Again, nothing. Didn't expect to. But if he makes it all the way to the end, I think I may buy a Constable Zuvio here. Another road trip, you say? Don't mind if I do! I really do want to visit every TRU I reasonably can, after all. And today was about going to the ones I'd gone to back in high school. This one, surprisingly, was not half an hour away from me - it was more like 40 minutes. And since it wasn't just a straight shot up or down the road to get there, I didn't go very often at all. What I most associate with it is going there with my college girlfriend: this TRU sits right next to a little indy book store, so one shopping plaza covered both our obsessions; we'd stop at the book store mainly for her but also for me, and then stop at TRU mainly for me but also for her. Both those stores have outlived the mall across the street, which is dead and empty now. The last time we were there, the only stores inside were a Hallmark and a pseudo-bodega. It was literally selling fresh fruit from crates that were sitting in the middle of the mall like a kiosk. Later someone was stabbed to death inside the movie theater. Observations: The "R Zone" (the electronics area) was almost empty. The action figure aisle had a layout I've never seen anywhere else: rather than being full-length shelves, there were little pass-through archways in the middle of them, allowing you to switch aisles quickly. I've been to plenty of TRUs, but none of them have had anything like this. What I got: Nothing. But I did half-heartedly try to take a sun-bleached TRU sign out of the window. Now this, this is my childhood Toys "Я" Us. It's been renovated, obviously, but that was "my" TRU for many years. Once I started getting my comics nearby, I went there once a week. I may have a different Local now, but this is the TRU I judge all others by. Or, well, the TRU it used to be, I guess. Things are different inside now. This store always seemed to get Lego sets earlier than everyone else - like, they would have the new sets for a given year before the old year was over. Observations: For ages they've had their McNECA stuff on the endcaps of the action figure aisles, but now it's all been moved back to the electronics area. The selection here is pretty good, too: they've also got some of the DC figures I got at that old KB for instance (I saw Reaper on the front of the pegs, but since I'd already gotten them, I didn't bother looking through the rest). What I got: Lego Architecure Chicago, Marvel Legends Hydra two-pack. While that TRU (the "half hour north" one) was my main store, this one (the "half hour south" one) was the backup. I never went down to this one as often as I went to the other, but I enjoyed knowing it was there. Observations: Though this will probably be the last time I'm ever there, what I actually think of as "the" last time was really years ago: I saw the Transformers Energon Grimlock and Swoop set there, and didn't buy it, which was a choice I regretted; as long as I never went back, I could imagine the set was still there, waiting for me to buy it. What I got: Pacific Rim Raijin, Prometheus Fifield, and Lego Superman & Krypto Team-Up.